Discussion in 'Sheltie Chat' started by GlennR, Apr 13, 2019. It seems that size is relative. 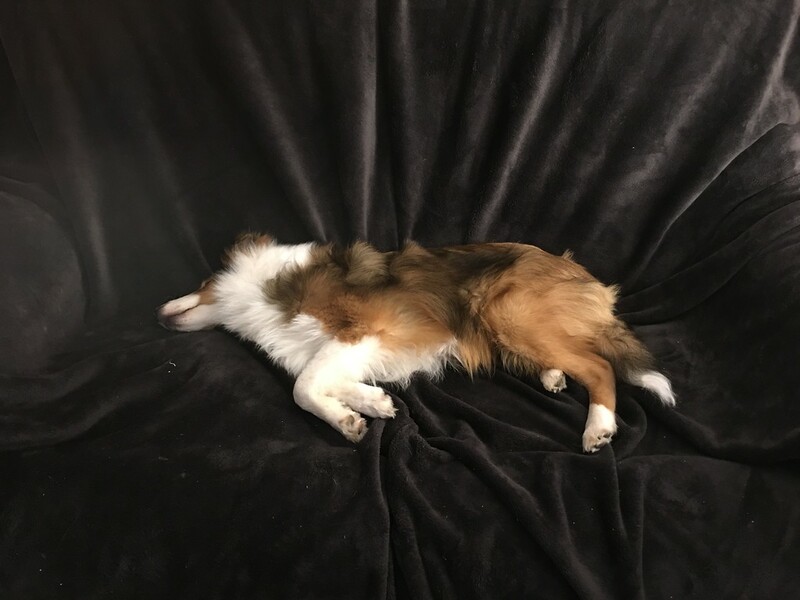 Our two seater sofa appears to be just right for two adult humans or one tired Sheltie. Poor babe, she leads a hard life playing, cuddling and eating. Calliesmom, corbinam, Hanne and 2 others like this. Just perfect! And such a lovely color to collect Sheltie fur too! It's hard work being a puppy! GlennR and Sandy in CT like this. GlennR, Calliesmom and Sandy in CT like this. GlennR, Sharon7 and SheepOfBlue like this. Yes but where do you set? Calliesmom, GlennR and Sharon7 like this. I get a spot- there's just room enough for all 4 too. Sca had his own chair which Sptifire could care less on. Angus liked it long enough to eat a hole in the arm and now it sets empty. Calliesmom and Sharon7 like this.